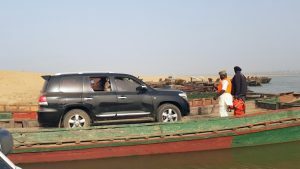 PHOTO News: Tambuwal, his cars ferried across River Benue – Royal Times of Nigeria. Governor Aminu Tambuwal on Wednesday led a delegation to Ibi Local Government Area of Taraba State to pay a condolence visit to the former chief whip of the House of Representatives, Isiaka Bawa, who lost his mother, Hajiya Hadiza, recently. 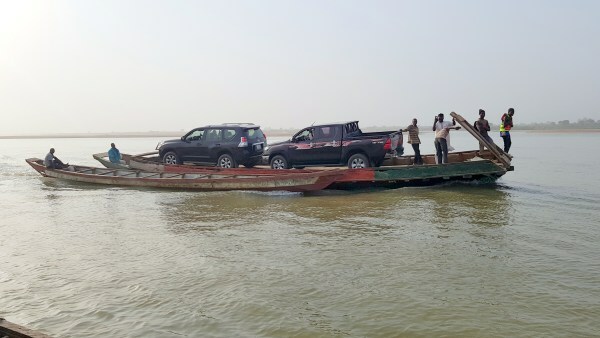 In the accompanying pictures, the governor and his convoy were ferried across River Benue into Ibi town on boats. One of the pictures show Tambuwal peeping through his car window and his car gets set for the dangerous 30 minute cruise across the river. The photos were sent to PREMIUM TIMES by Mr. Tambuwal’s spokesperson, Imam Imam.